Tony was baptized at an early age at Central Baptist Church in Essex Maryland and later attended Harbor Heights Baptist Church in Dundalk, Maryland. He was a 1994 graduate of Patterson High School and worked several manufacturing jobs prior to his relocation to York, Pa. In 2002, he went to the White Rose Restaurant, and there were only two seats available, he sat down, and Latasha sat in the other, and a relationship of love and friendship resulted in marriage. Tony loved basketball, boxing, wrestling and was an avid Baltimore Ravens Fan. There were many Sundays in the Perry household that were filled with cheering, fun and fury because Latasha is a member of Steeler nation. Tony enjoyed writing poetry and has many poems that he shared with his family. He loved to walk and enjoyed watching “throwback” television shows like Golden Girls, Mama’s family, Good Times, Fred Sanford & Son, Martin and Living Single. Tony had a compassion for social awareness and community issues and expressed his support for his community and neighborhood. Anthony Thomas Perry was the beloved husband of Latasha Orr Perry. He was also the father of A’naya Perry and step-father of Nastasha and Kianni Wright. He is survived by his brother and best friend Jeremy Perry (Tia) and his father, Willie T. Perry (Georgia), Linda Orr, mother-in-law, Jason Orr, brother-in law and three sisters-in-laws - Crista Orr, Alecia Orr & Catrice White. He was the grandson of Minnie Williams and nephew of Andrew Perry, Jr., Richard Perry, John Williams and Tommy Williams. He was very close to his brother Jeremy’s children (nieces and nephew) - Jeremy Jr., Jordon and Reese. He also had a special relationship with his marital granddad, Leroy Orr and marital Grand Uncle, Charles Orr, and maternal aunts Mary Rice and Vivian Williams. He was preceded in death by his mother, Brenda Perry, his grandparents, Berta Bell, Andrew Perry Sr., his very special grandmother-in-law Ruth Orr and his father-in law Roy C. Orr. He is also survived by a host of relatives - Aunts, Uncle, nieces, nephews and cousins. To send flowers or a remembrance gift to the family of Anthony Thomas Perry, please visit our Tribute Store. 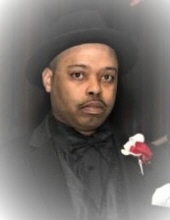 "Email Address" would like to share the life celebration of Anthony Thomas Perry. Click on the "link" to go to share a favorite memory or leave a condolence message for the family.